This was, at least, a sacrilegious attack on the Roman tradition of the worshipful reverence and holiness in approaching the sacred altar. This deconstruction of the Roman rubrics for receiving the Body and Blood of Our Lord Jesus Christ in the "Novus Ordo Missae" was a "liturgical time bomb", as the late Michael Davies has said that was heard around the entire Catholic world. Thus began the modernist revolution and woeful decline of the centuries-old Roman rubrics of faithful Catholics in receiving the Eucharist with holy reverence. The initial removal of communion rails, which separated for ages the faithful from the clerics, literally opened the altar of God to this invasion of the sanctuary by the unordained for the first time in centuries, facilitating the sacrilegious innovation of Communion in the hand. Likewise this was the first salvo in a seemingly endless barrage of wreckovation attacks of the holy temple of God by the modernists after Vatican II. In fact, more deleterious to the collapse of Roman rubrics than anything else-- even the "Novus Ordo Missae" itself-- was the irreverent innovation of Communion in the hand. And if we do not recognize the perilous crisis of Roman rubrics precipitated by this liberal innovation of Communion in the hand from these serious words of St. Paul, the last of the most holy apostles to whom Christ Himself appeared; let us, further, contemplate the following most ominous words from this same greatest of teachers of the Holy Catholic faith: "Whosoever shall eat this Bread or drink the Chalice of the Lord unworthily, shall be guilty of the Body and Blood of the Lord...he that eateth and drinketh unworthily, eateth and drinketh judgment to himself, not discerning the Body of the Lord." i.e. acting as though he did not recognize that the Body of Christ is present. And what do we have today but the vast majority of "Novus Ordo" Catholics eating and drinking the Body of the Lord unworthily, i.e. acting as though they do not recognize that the Body of Christ is present. And what, more than anything else verifies this reality of unworthy reception? Yes, it is the blatant impropriety of their comportment before the most Holy Eucharist in violation of this strict Pauline directive of acting as though the Body of Christ were not present. Yes, it is also the deconstruction of the Roman rubrics for the last forty years of the "Novus Ordo Missae". 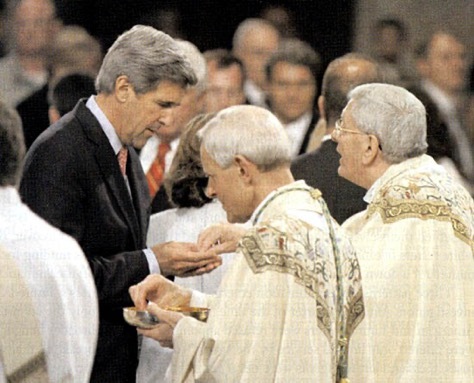 Therefore, this is, at least, an involuntary sacrilege each time Communion in the hand is received by the faithful in the "Novus Ordo Missae". Why? As Satan tempted Christ in His forty days fast in the desert to exchange mere rocks into earthly bread in order to satisfy Christ's hunger, instead of being satisfied with the heavenly bread of doing His Father's holy Will, so has Satan tempted many, many Catholics to do this very same thing today by receiving the Holy Eucharist as though it were the mundane bread of this world by receiving it in their hands. In other words, it pleases Satan that Catholics are acting today as though it were not heavenly bread they are receiving with the most Holy Eucharist but merely the mundane bread of this world. To Almighty God this is nothing less than the most serious affront to His Divine Presence and a most serious sin to willfully receive His Body, Blood, Soul, and Divinity as though one were eating earthly bread. Knowing that this is not the general attitude of those receiving the Eucharist, prayerfully, in their hearts; nonetheless, it must be a venial sin of disrespect, at least, to not adore Almighty God with the kind of respect that is His due whether it be in thought word, or deed. Indeed it is nothing less than an outward sign of disrespect and violation of the First Commandment. External comportment cannot long hide the true dispositions of an unrecollected heart. In fact, this is the very same sacrilegious disrespect encouraged by Thomas Cramner and the Protestant Reformers with their unrelenting advocacy of Communion in the hands. These same sinful aberrations of not worshiping God with the kind of humble adoration that He deserves are replete in the liberalized anti-Roman rubrics of the entire "Novus Ordo" debacle, if one considers the endless idle chatter, before, during, or after the New Mass; the failure to genuflect universally before the tabernacle--if and when it is present-- and the removal of kneelers to facilitate only standing and sitting when one should be kneeling in deference to the strict Pauline teaching on correct ecclesiastical protocol before Christ's infinite presence at the altar of God. The sinful public disrespect, today, of the "Novus Ordo" ritual is not only pandemic but monumental. For Modernists this is the man-centered horizontal worship of liberal Protestantism, an impious novelty of the New Mass, which counters the centuries-old Roman rubrics that are vertically oriented to God in total adoration of thought, word, and deed. Not in thought, not in word, not in deed should orthodox Roman Catholics ever dare to offend Almighty God at Mass, either seriously or venially, by the innumerable offenses of the Novus Ordo rubrics that mitigate the adoration we owe to Our Lord, especially from Communion in the hand--the most egregious of them all; or we shall ignore Christ's ominous words and His everlasting warning of not exchanging the Bread of heaven for the bread of this world: "Man does not live by bread alone but by every word that comes froth from the Mouth of God." The flock has been besieged for too long and the sheep are separated from their Master's Love. Only the firm hand of Christ's Shepherd, Benedict XVI, tending His flock with love, will return the wandering sheep to the orthodox Roman Catholic fold to end this sacrilegious outrage of Communion in the hand and divers other sins of disrespect in the "Novus Ordo Missae". The flock will then liberally feed upon the true Bread of Life and Our Lord's abundance of graces, untrammeled by the ravenous wolves who lay snares of death and destruction for the starving souls of the sheepfold.